BEAR Scotland, along with Scotland TranServ and Amey, have launched the campaign alongside Transport Scotland after a report revealed the abuse and threats their workers had experienced in the last year, including three quarters of workers being verbally abused. The campaign has gathered support from a number of national motoring and worker safety organisations, including the RAC. The types of missiles reported as having been thrown from passing vehicles included eggs, bananas, beer cans, bricks and bottles of urine. 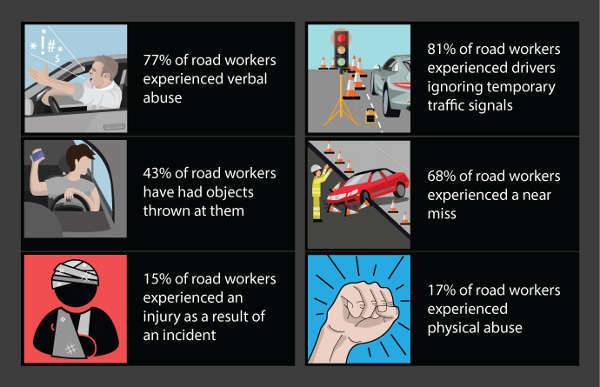 86% of workers surveyed had experienced road users ignoring red lights. 73% of respondents experienced motorists entering the works safe-zone area in the past year. 75% of employees received verbal abuse from passing motorists in the past year. Nearly one out of three road workers experienced missiles being thrown towards them in the past year by passing motorists. This included bottles of juice, coffee cups, eggs, foam bullets, food wrappers and banana skins – as well as reports of bottles of urine and even a dirty nappy. A number of instances were reported of threatening behaviour being made to roadworkers on road closure points. Eddie Ross, on behalf of BEAR Scotland covering the North West of Scotland, said: ‘We understand that no one likes being held up at roadworks and we try hard to minimise disruption as much as possible.